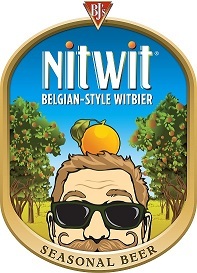 We are thrilled to have tapped a seasonal favorite that has been away for a little while; welcome the return of NitWit®! This refreshing seasonal beer is a traditional Belgian-style Witbier that literally means “White Beer”, and it is phenomenal. The creation of NitWit actually marks the beginning of my relationship with my now wife! Melissa began working for BJ’s Brewery in Chandler as an assistant brewer and I told her she could come up with her own beer, whatever she wanted to make. She was passionate about making a Belgian-style, wheat based witbier. She was given the green light, and she began brewing full force! Using pilsner type malts, traditional Belgian witbier yeast, coriander and orange peel, Melissa brewed what we decided to call NitWit, which was then entered at GABF and won the gold medal! This beer has gone on to win more major awards than any other BJ’s Beer! It was an amazing beer to work on with her and get to know her over. Eventually, we started dating and we’ve been together ever since. So as you can imagine, I have a real fondness for this beer. I’m often asked how we came up with the name NitWit, and whether the beer is named after anyone we know. The truth is, Melissa’s friend Marlene visited one day and they brainstormed over different names. Marlene made a funny face when they said the word NitWit and they both laughed hysterically. To this day I think they were both thinking of me when they were laughing. Now that Melissa is my wife, I am certain that I am her true NitWit. This beer is incredibly light and refreshing. It’s great to enjoy on its own on a nice warm Spring day, but it also goes great with a lot of our dishes here at BJ’s. Try it with any one of our salads, our new Cantina Chicken Tavern-Cut Pizza, or our Mediterranean Chicken Pita Tacos! 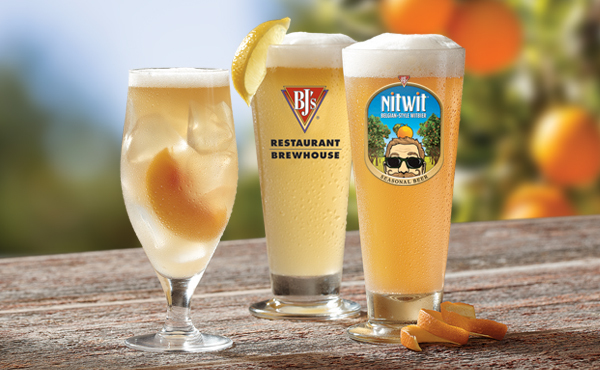 After you’ve tried the original BJ’s NitWit, you might try the 2 friends that it shares the stage with this year: the NitWit Shandy: NitWit and Lemonade, and Fuzzy NitWit : NitWit, Milagro Silver Tequila, Monin White Peach, Fresh Lemon, and Fresh Peach. Hope to see you for a refreshing glass with us at BJ’s! Hurry in and get it before it’s gone!